his is one of my favorite beers. I really wish it was one I could buy around here. 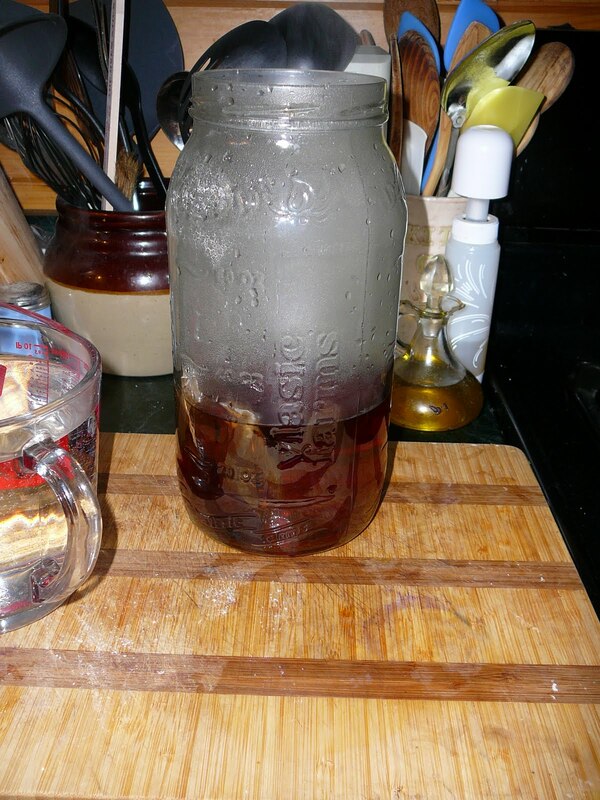 So instead, I brewed up a clone-ish beer, that Aldwer Wood Smoked Porter. We’ll see. Molly Lee Cards: Superhero card saves the day! pset is a good description of how I feel about Danstar right now. I’ve been reading about old complaints of an issue with Nottingham yeast. It appears some have had issues for possibly up to a year. Danstar is replacing yeast packets matching their only claimed issue batch #1081140110V exp 01-2011. I have one unused packet. 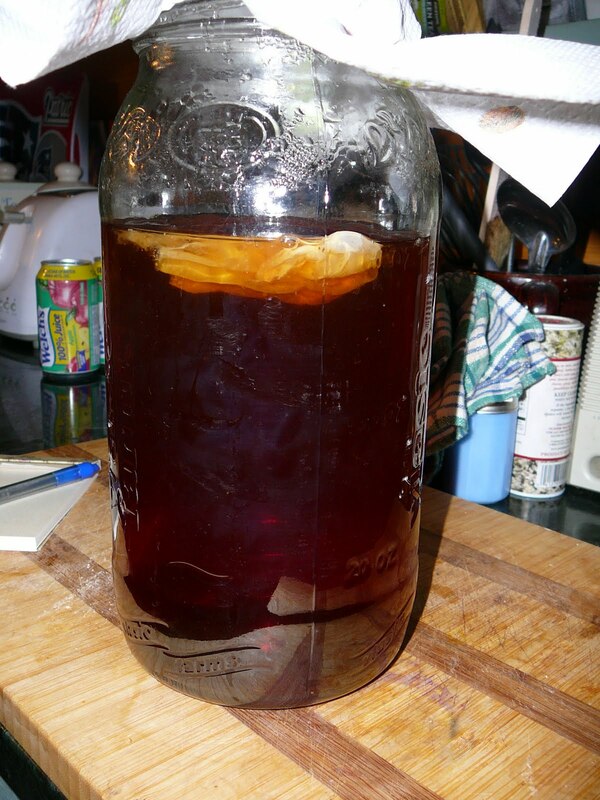 I, unfortunately used one packet on my Earl Grey Braggot but threw away the packet, not knowing there was an issue. It ruined my batch. 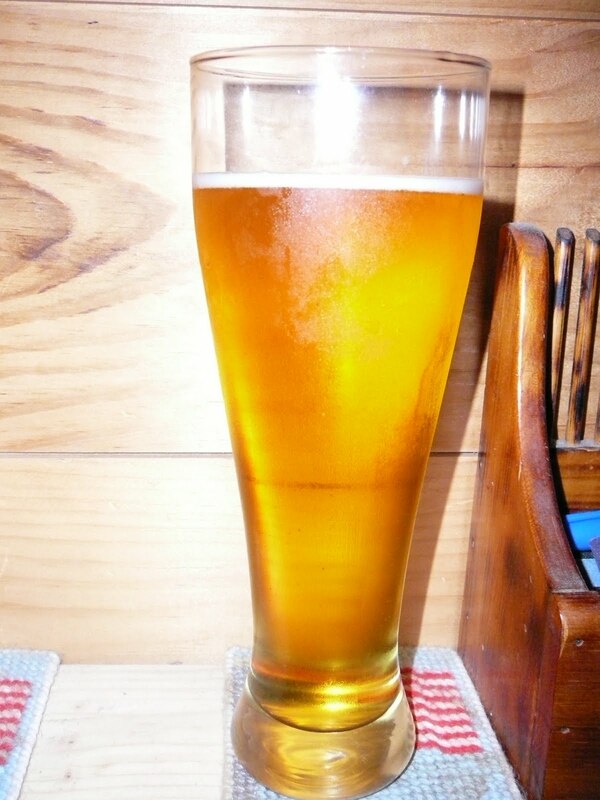 I used a packet of Notty from batch #1080360088V exp 08-2010 on my Haus Pale Ale. It ruined my batch. 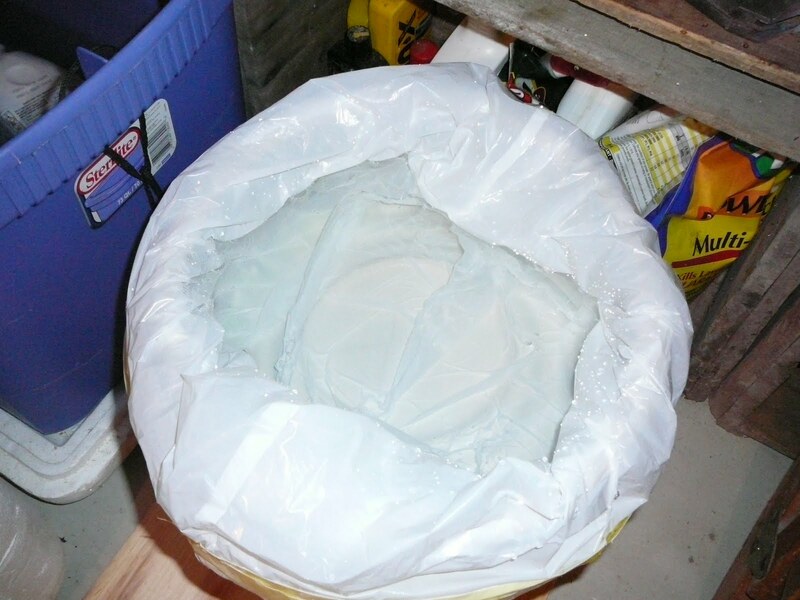 I yanked the packet out of the trash when I read about the Notty issues, hoping to find it was the bad batch causing my ale to not take off by the next day. It wasn’t the recall batch. yet it still took 60+ hours to take off. I’ve never had a beer not take off in the overnight after pitching the day before. I hear others had issue with the same batch, yet Danstar admits to nothing. I contacted them indicating there was an issue and they denied it. The packet is punctured. You can clearly see it. Others see the same punctures on their packets that ruined their beer too. What do I want? Certainly not more packets of Notty in return for packets turned in. That does nothing for me. A $20 pale ale and a $30 braggot was ruined. And 12 hours of my time just between brewing and bottling these beers, never mind the tending time. 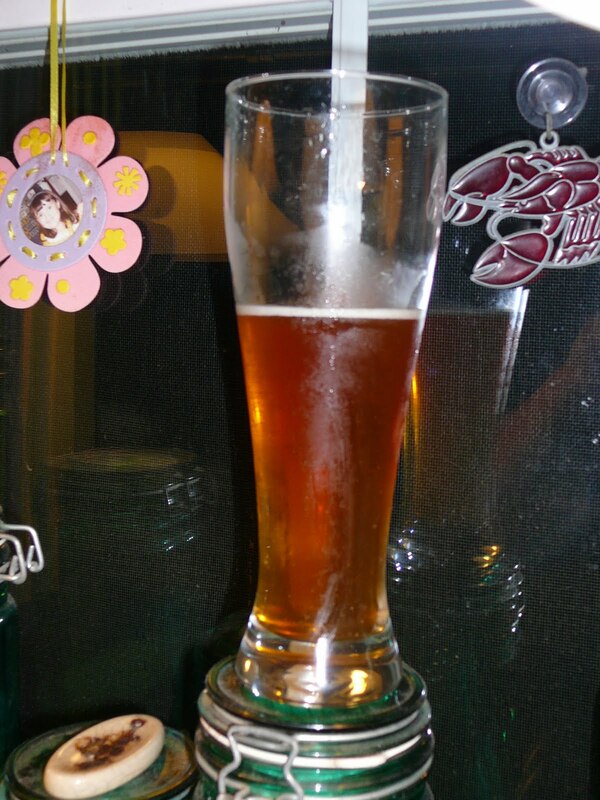 Also, the pale ale was brewed up in celebration of a new part time job I got after being unemployed for several months. To make it special, I tossed in my first ever hops harvest. No $3 packet of new yeast is going to make up for that. I have 3 more packets of the #1080360088V exp 08-2010 that I won’t use. Too much of a risk. Anyways, here’s a review of what was supposed to be my special Christmas braggot. A: Caramel orange. Very thin head. S: Spicy and sweet. Big nose. T: Very complex! Spicy and sweet. There’s an off flavor to it, bandaidey. Most likely attributed to the bad Notty yeast. But I think I got it onto the S-05 yeast cake soon enough to help it some. By the time you get 1/3 of the way through the glass, the medicinal taste takes over too much. I was barely able to finish the last 2/3. D: One will do fine. It’s a cozy braggot for a cold night. The bad yeast flavor totally detracts from this brew. It tastes like it could have been really good. It looks really good. It begins to taste really good. 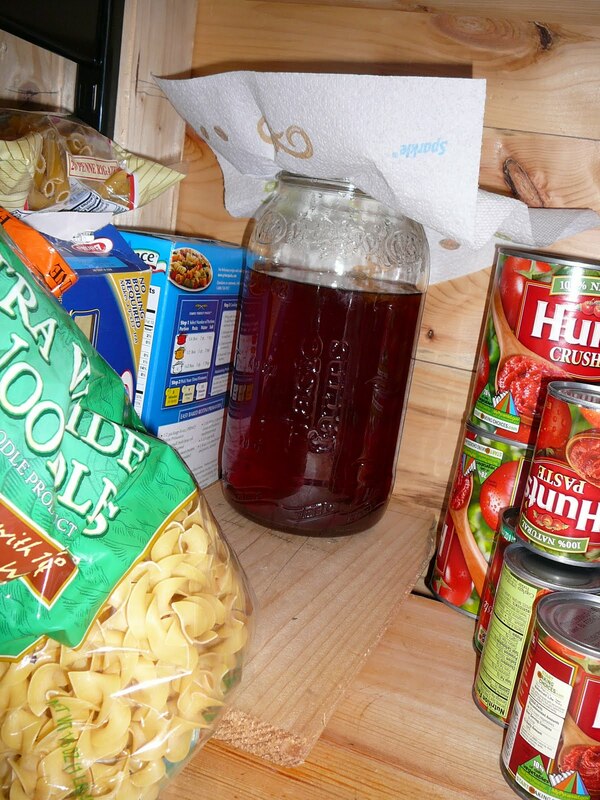 Then WHAMO…yucky off flavor. I think I will let this one age and see if we lose any of the off flavor. ottingham yeast is usually my “go-to” yeast. It has a very clean profile, good flocculation, it’s easy to use being a dry yeast, and it is very economical. Unfortunately, they have had a bad run. Danstar has admitted to one bad yeast batch #1081140118V exp 01-2011 out Austria. 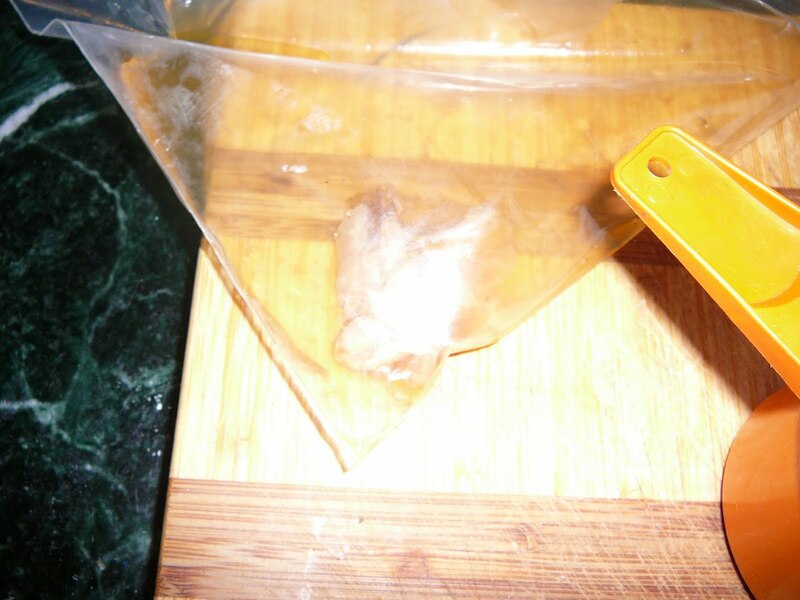 The stamping machine punctured the package and the yeast may have been damaged by oxygen. I had one of those packets and it did not take off in my Braggot. I pitched the Braggot onto a yeast cake after no activity for too long for my comfort. I’ve got another packet here with that batch number. I also have a packet from a different batch #1080360088V exp 08-2010 out of Denmark. The packet is just as damaged by a stamping machine but Danstar admits nothing wrong with this batch. I strongly disagree. They are replacing bad packets, but that doesn’t replace money homebrewers are out in ingredients from ruined batches. They claim the only damage is a slow take off. I unfortunately brewed up a Haus Pale Ale in celebration of getting some part time employment. It took forever to take off and when it finally did, it smelled funky. 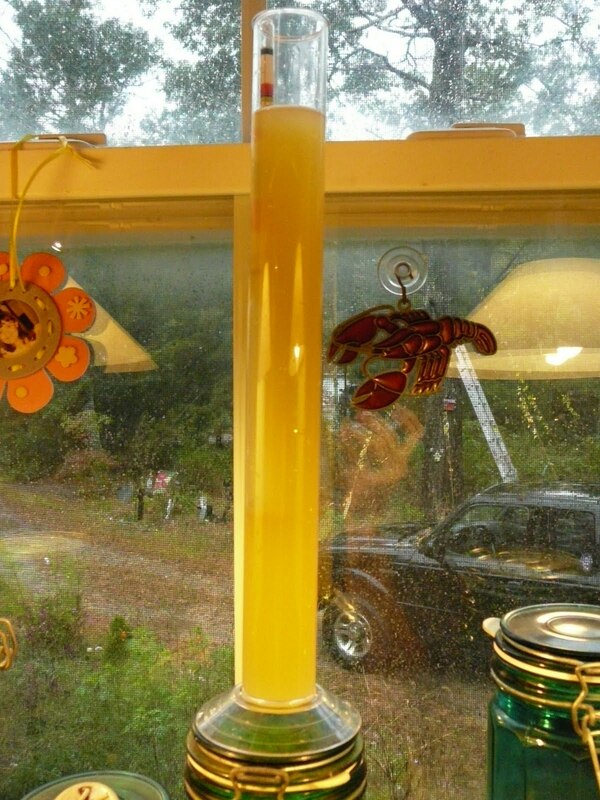 Today, I bottled that beer, 5 weeks sitting in the primary. Cloudiest beer I have ever seen. Smelled very off from the other times I brewed this same recipe. I’ll give it the three weeks to see how it tastes before I pass final judgment. I could have thrown some gelatin at this to get it to clear up, but I’m pretty sure it wouldn’t be worth the effort. As I said, we’ll give it the benefit of time before final judgment is made. 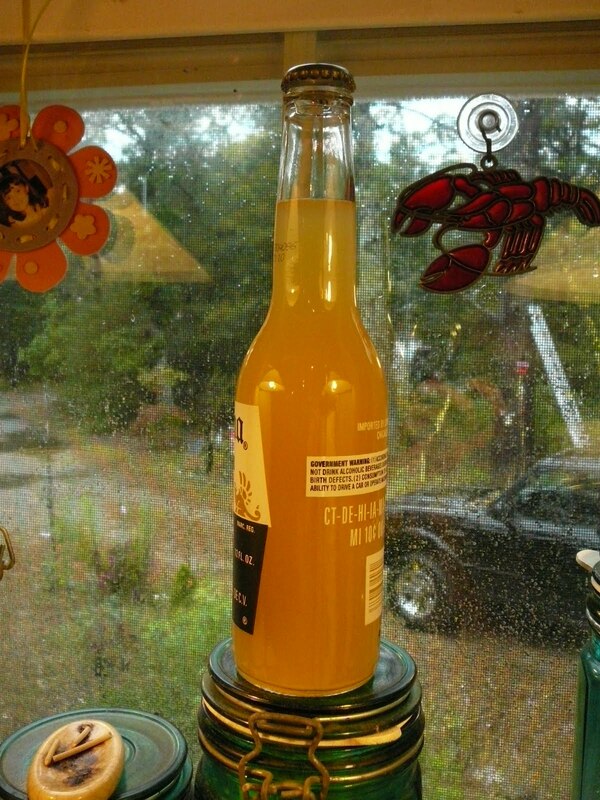 At least this I made a Corona bottle happy…for now, three weeks from now…who knows. pfelwein is so beautiful in the glass. This is my carbed version, just over 5 months in the bottle now. Mmmmm. abbage was on sale for $0.25 a pound so Sarah picked up four large heads to make into sauerkraut. 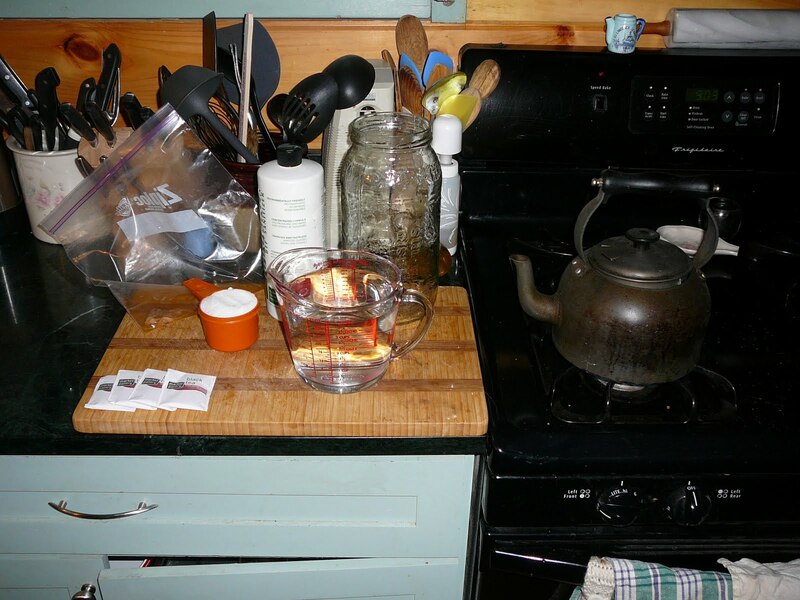 AND as luck would have it, someone offered up a ton of canning jars for free on freecycle! Time for sauerkraut! 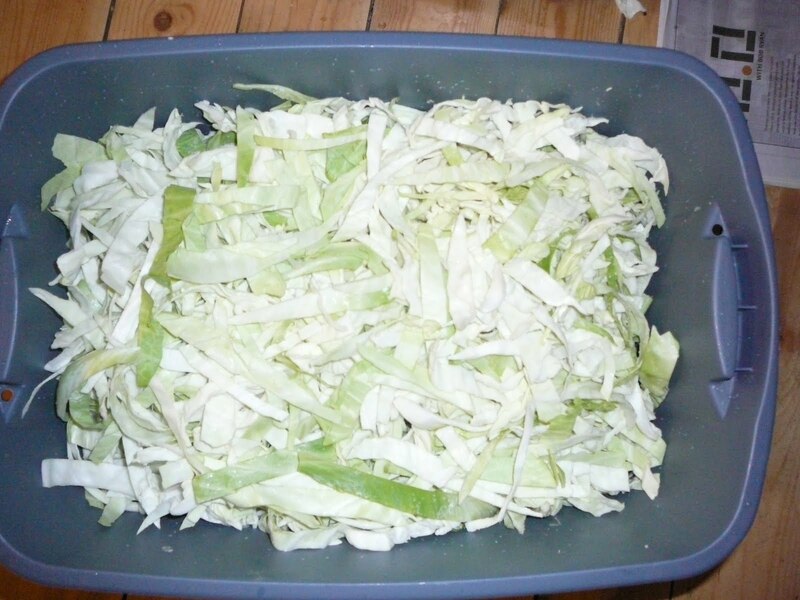 Here is the 17 pounds (shredded weight) of cabbage ready to start the process of becoming yummy sauerkraut. Since I am a homebrewer and I have a beer to bottle tomorrow anyways, I mixed up a batch of sanitizer. 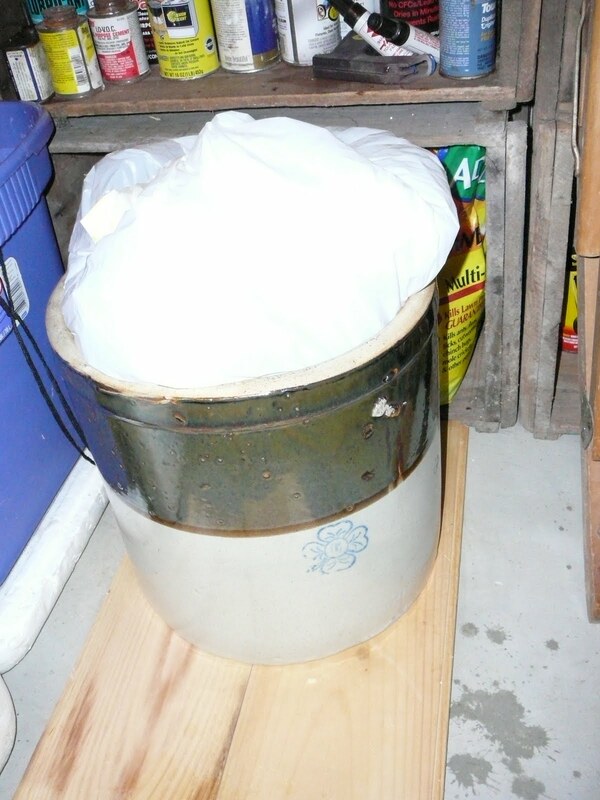 Figured I’d use it on the bucket for mixing the cabbage and salt as well as the crock. A little cabbage and a little salt get mixed up by my sanitized hands. 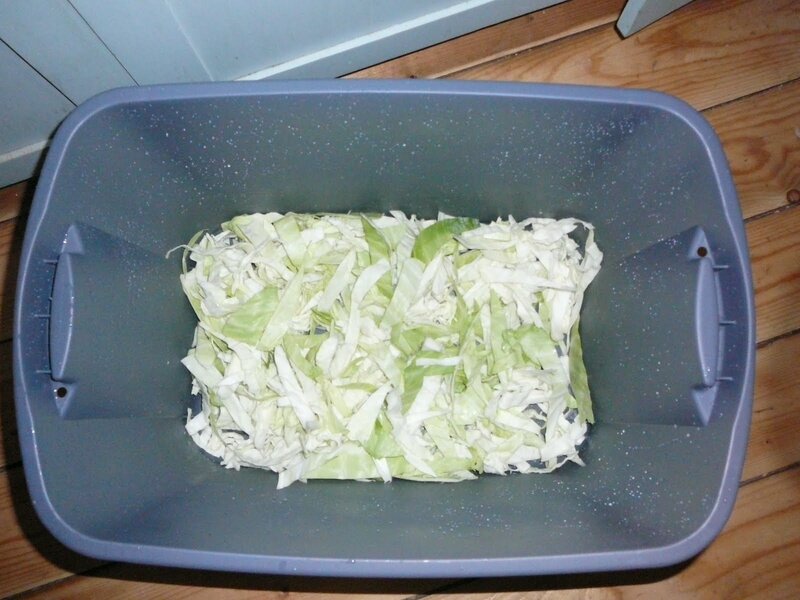 Here is the cabbage all mixed up with the salt in the tub. 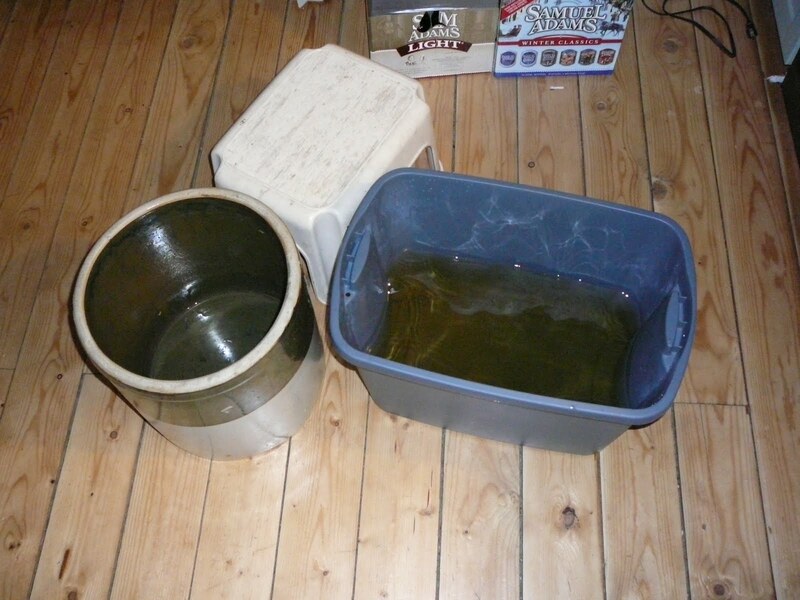 Ready to be packed into the crock tightly. 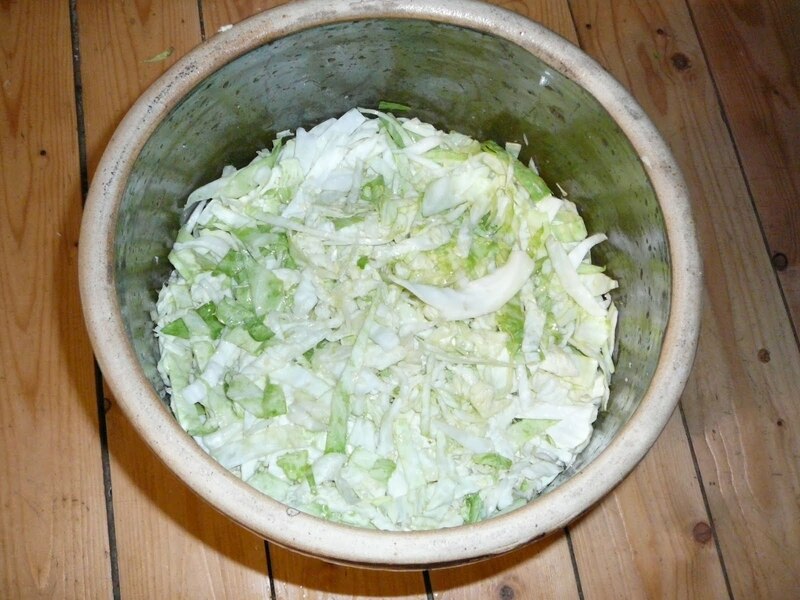 Here is the salted cabbage pressed into the crock tightly. 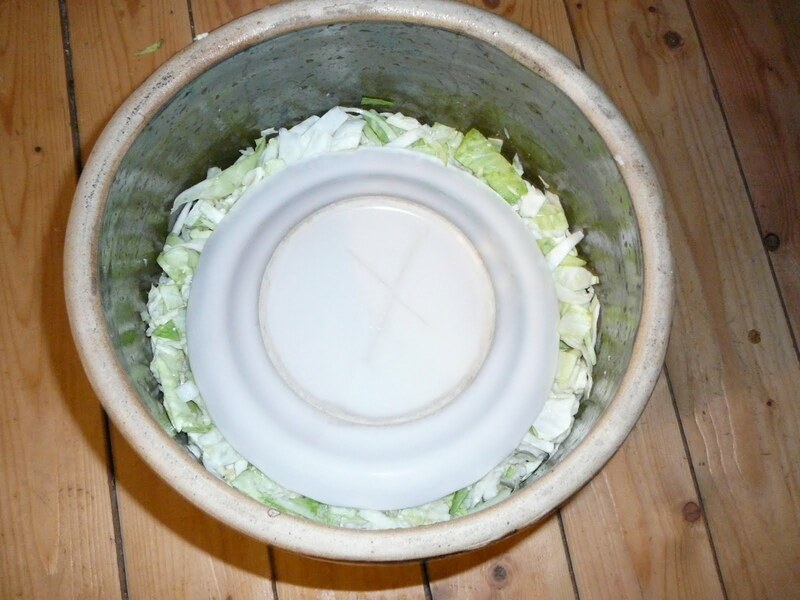 A plate is placed on top for weighning down the cabbage. This is ready to go to the basement for fermentation. 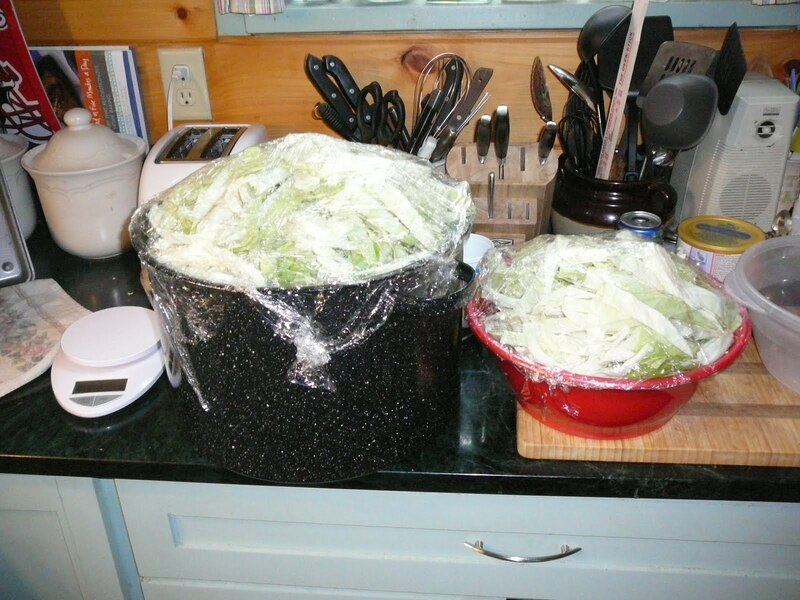 Fill the Bag up with water to create a nice seal and way down the cabbage in the brine. And here it will sit for over a month, fermenting into yummy kraut.